Clear plastic gift bag, 5 1/2" x 2 3/4" x 13 3/4". High clarity, FDA/USDA approved for food. Cardboard insert for added stability. 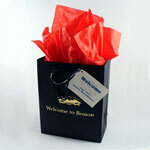 Ideal for combining items into door prizes or gift sets.